You’ll never think of cauliflower the same way again after one bite of this Parmesan Roasted Cauliflower with caramelized onions and fresh thyme. Cauliflower always gets the bum rap and seems like an afterthought addition to the menu. It gets left on the veggie tray, soggy and steamed, but no more! I made this Parmesan Roasted Cauliflower that I found in Bon Appetit a couple of weeks ago, and this recipe hit it out of the park. Roasting the cauliflower mellows the taste and brings out the sweetness in it. Add to it caramelized onions, thyme, garlic and nutty parmesan cheese, and you have a a dynamic combination – one that even cauliflowers haters will embrace. Gone are the days of serving steamed cauliflower with the thick orange cheese sauce and dill dip. Once you roast it, it will be hard to go back. It always amazes me how roasting vegetables brings out a different taste. 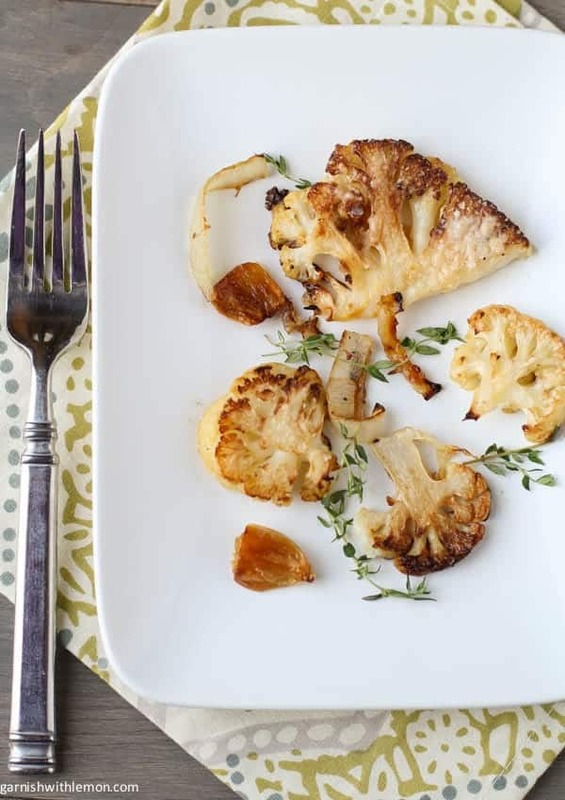 This roasted cauliflower is so rich and flavor-packed from the thyme, garlic and onion and olive oil. And easy peasy to make, too. Clean the cauliflower head and cut off the bottom leaves while leaving the head intact. Slice it in 1-inch sections through the head. The thick sections of cauliflower brown and caramelize when they lie flat on the pan. To die for, I promise. And yes, I’m still talking cauliflower here. Eat this for lunch, with pasta, add it to a salad, or keep it as a traditional side. Whichever way it is served, it is a tasty addition to the menu and a fabulous way to get more veg in your meals. Make cauliflower the star instead of the side show. You won’t regret it. Clean cauliflower and cut in sections. In a large bowl, toss sliced onion, thyme, sprigs, and garlic with olive oil. Season with salt and pepper and gently toss again. Spread cauliflower mixture on a roasting pan and roast for 30 minutes. Turn the cauliflower over to brown other side and add the parmesan cheese. Roast for another 10- 15 minutes. Serve warm or at room temperature. I think roasting cauliflower is the best. It really brings the sweet flavors out. It is also a great way to get the little ones to eat something healthy. I agree, Julia! Amazing what the kids will eat when it is prepared in different ways! I do too, Arthur! So delicious! Roasted veggies are my favorite! I make them pretty much every week, so I’m always interested in new recipes. 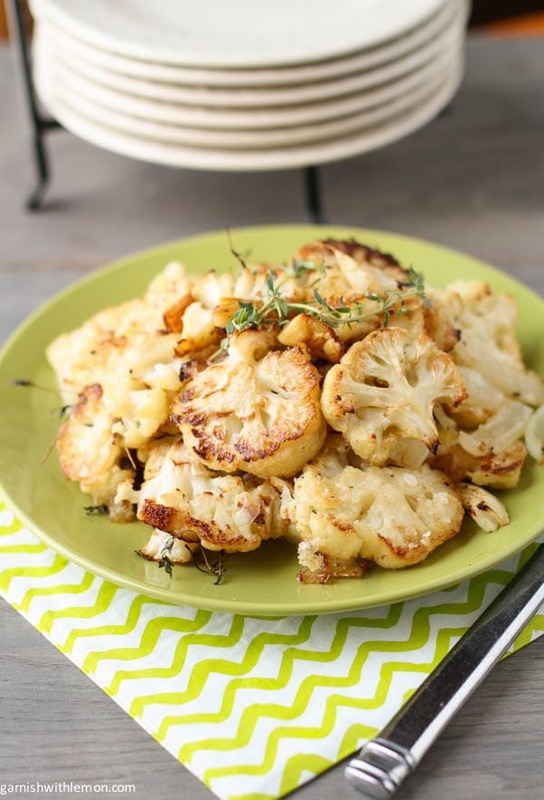 LOVE your idea of roasting up cauliflower with parmesan! This is such a beautiful and healthy dish! Hi Julia, Roasting vegetables adds so much flavor- doesn’t it? Such a fabulous way to eat them. Thanks for stopping by our site! Hi Lindsay- It was a fun one for photos! Thanks for visiting our blog and your great feedback! I saw this in bon appetit and wanted to try it! I love cauliflower and this sounds like a great way to feature it! Hi Liz, That is where I saw it too. Definitely worth trying out-my new favorite way to eat cauliflower! I’m sold! I feel bad now for always passing right by the cauliflower. I’ve really gotten into roasting vegetables this winter and have expanded what we’ve been eating (parsnips, sweet potatoes, etc. )–time to stop ignoring the poor cauliflower! Thanks for the inspiration! I know, I used to do the same thing. But no more, this is in my regular rotation! Yum! I love roasted veggies! Cauliflower is one of my favorites, this looks wonderful! Ok, I just have to say that you two are adorable! I love your about me page and I can totally relate to everything you wrote. I love wearing my lulu lemon pants everywhere besides the gym as well. I also love the Wednesday night wine drinking excuse. I started my blog about a little over a year ago for the same reasons you both did, to share recipes that my family and I loved with friends! My hubby was born and raised in Wayzata which is just outside of MPLS. I also lived in Mpls for 3 years before I got married. I love that place and I miss Lake of the Isles and Lake Harriet. I use to rollerblade around those lakes all the time. We have many friends and family in the Twin Cities, so I will pass on your blog to them, who knows, you might even know some of them. I love your recipes as they are totally what we eat as well. I can’t wait to check out more on your site. BTW, your blog is beautiful and so easy to follow. I have been wanting to upgrade my recipe page with photos, do you mind telling me who designed your recipe page? My email is [email protected]. I’m rambling here, but I feel like you two are my Minnesota blogging sisters. Have a great night! Thanks for your nice note! Love the Minnesota connections! The Lakes are great aren’t they? SO fun to sepnd time around them during the summer! Wayzata is about 25 min from us, we are on the other side of the metro but know it well! I found your blog today through foodgawker and can’t wait to spend more time on it! So glad we connected! i tried this a few days ago and it was so delicious! i couldn’t stop eating it! 🙂 loved it! i usually make mashed cauliflower and this was nice for a change. i really enjoyed this recipe. I’ve never really liked cauliflower, but I’m growing some in my garden right now. I find if I don’t like a veggie, like zucchini, if I grow it myself, I like it because it tastes so much better. Your recipe looks great, so I’ll give it a try. Thanks! I’ve been looking for a good cauliflower recipe. Thank you for this. Can’t go wrong when it’s got parmesan cheese and garlic. Agreed! Parmesan and garlic make everything better! Thank you so much! I’m a new blogger as well as a newly wed so my skills in the kitchen are VERY minimal! This was the tastiest recipe ever!! I hope I did it correctly as I tried re-posting on my blog with the correct attributes so my friends/family can have it too! If there is something I should add please let me know so you get credit (this is so new to me lol I’m sorry). Made it last night, and my husband who hates vegetables, ATE SOME! Still in shock….Thank you! Hi Emma-Jane, Thanks so much for your note! What a great idea to add the turkey-sausage right to the pan! Sounds wonderful! My family and I love this recipe. I make it all the time now. Tonight my son wanted broccoli too, so when it was time to flip the cauliflower, I added broccoli that was tossed in EVOO and salt and pepper. It turned out perfect. Thanks for the wonderful recipe! How cool is it that your son asked for broccoli? I will have to try it. Thanks for your note! I used to make this often but lost my recipes in Katrina and forgot all about this fab method! Returning it to the recipe box today! Thanks! How awful you lost all of your recipes! I’m glad I could help a little bit. Enjoy! I’m going to use scallions, I don’t like regular onions – yuk.